Ars Notoria. 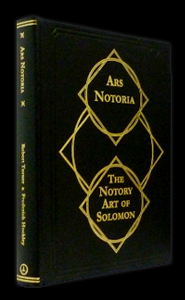 The Notary Art of Solomon. Translated by Robert Turner 1656. Transcribed with additions by Frederick Hockley 1839. Edited and with an Introduction by Alan Thorogood. and with an Essay, "The Philomath," by Robin E. Cousins. Import USA: The Teitan Press, 2015. York Beach, Maine, USA: Teitan Press, 2015. First Edition Hardcover. Small Quarto. lviii + 100p, [+ 140pp MSS facsimile ]. Bound in high quality black cloth, with a gilt design after Hockley stamped on the front cover, blind rules; gilt-lettered spine. Sewn, printed on acid free paper. Black endpapers. B/w & plates. Edition limited to 650 hand-numbered copies. An important new edition of the "Ars Notoria," the well-known mediaeval magical work (often termed a grimoire) that was designed to equip the practitioner with "knowledge of every science, of all arts and all learning ... in other words everything that is within human capacity to know." This Teitan Press edition is drawn from a manuscript by Frederick Hockley (1809-1885), which itself is based on the 1657 edition by Robert Turner. The volume begins with an Introduction by Alan Thorogood, in which he examines the history of the "Ars Notoria," the different versions of the text, and the context in which Hockley prepared his manuscript version. This is followed by "The Philomath," a significant 24 page biographical study (with bibliography) of Robert Turner, the original translator of the "Ars Notoria" and a major figure in post-Elizabethan British occultism, about whom little has been known until now. Then there is a complete transcription of Hockley's manuscript of the "Ars Notoria," edited with explanatory footnotes and in comparison with other versions of the text (including Turner's and the Latin critical edition). The book ends with a 140 page facsimile of the original Hockley manuscript, printed on special coated paper that gives a photograph like quality to the reproduction. NEW book, fine condition. No dust jacket issued.